This post contains affiliate links. This means that if you decide to go ahead and make a purchase, I might receive a small commission (at no extra cost to you) that helps me keep the blog going. Thank you for your support. You know those crispy fried noodles you can sometimes get with a Chinese takeaway? I miss them a lot. Like, really, a lot. Until suddenly once day, I thought to myself that parsnips are quite sturdy and they turn a lovely chewy-crispy texture when they're roasted or fried - and they don't go soggy very easily. They would totally work as a crispy noodle replacement. Golden, crisp, chewy and seasoned with garlic, ginger and the sweetness of stir-fried spring onions. The noodles only take about 5 minutes to cook, so just fry them last, when you're ready to dish up your main course. Wash and peel the parsnips. Run a julienne peeler down them (careful with your fingers!) to cut them into thin matchsticks, or spiralize them using the thinnest setting. You could also slice them with a potato peeler and then carefully cut them into matchstick shapes if you like. 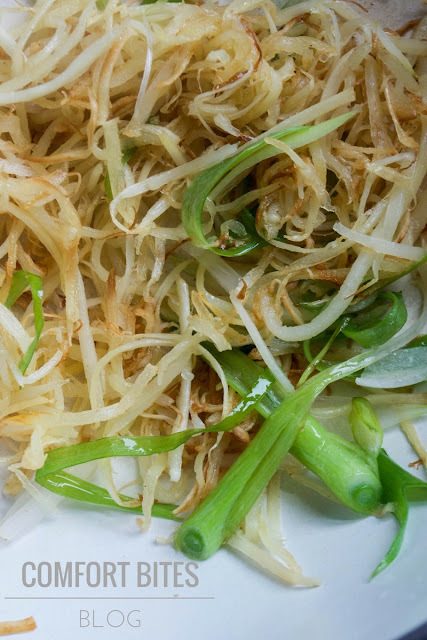 Heat the coconut oil in a large frying pan and drop in the parsnip noodles. Cook on a medium heat, until softened and just beginning to turn crisp and golden. Add in the ginger and the garlic salt and stir before throwing in the sliced green onions. Toss everything together for a few more seconds until the onions have started to wilt and soften. Note: If you tolerate it, a tiny drizzle of sesame oil and a splash of dark soy sauce (skip the sesame oil and use coconut aminos for AIP) is really good here, too. Made this recipe? Tag me in @joromerofood on Instagram and Twitter or @comfortbitesautoimmunepaleo on Facebook. I love to see your creations! Love takeaway food? Looking for more ways to play with herbs and spices on the autoimmune protocol (AIP)? I've written an ebook with over 90 recipes called SPICE that will guide you through herbs and spices on AIP, and you can download it on your Kindle app or Kindle device here.